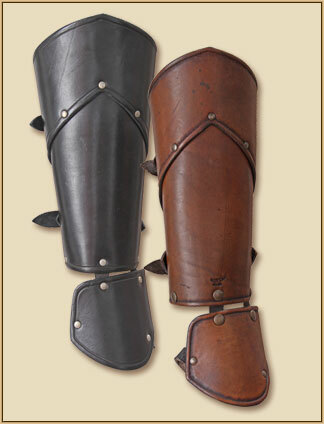 These leather armours are not guaranteed suitable for re-enactment with steel weapons. 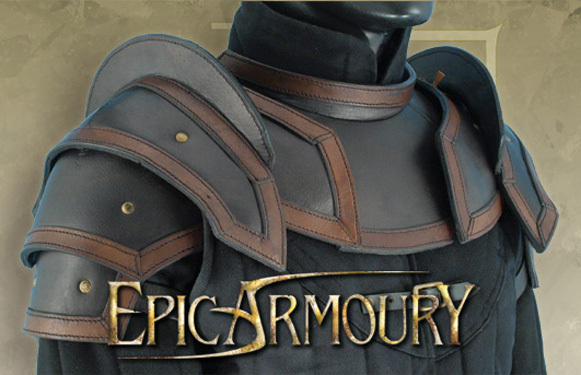 Leather armour that covers 1 shoulder and upper arm. By altering the strap arrangement it can be made to fit either arm. Ideal for that 'Gladiator' look. 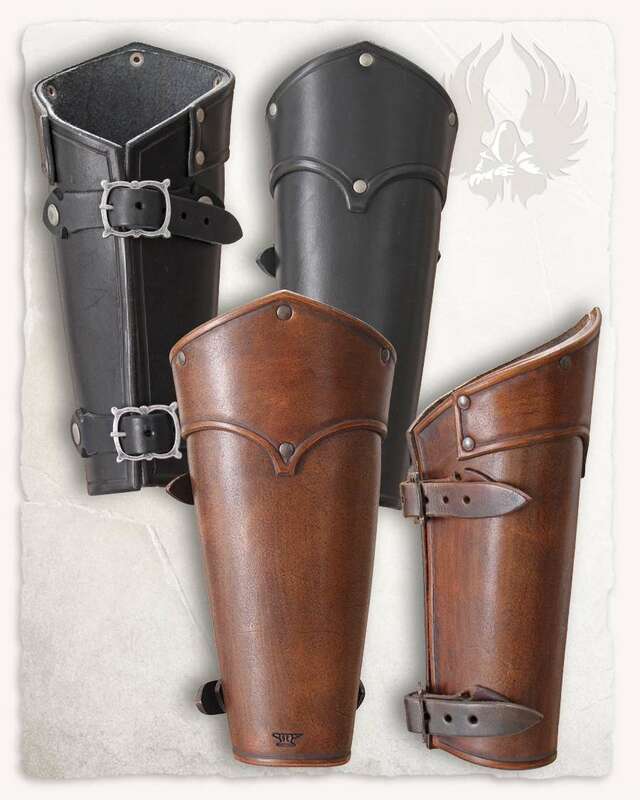 These bracers are closed by two buckles and adapt to almost every arm. The lavish production and the extravagant style make them an eyecatcher! 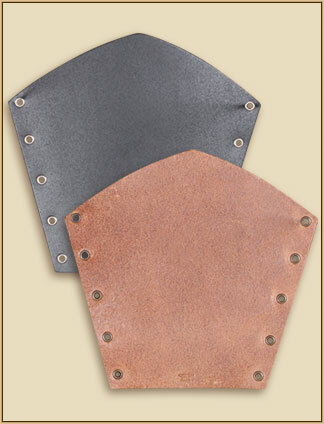 These elegant bracers are composed of three riveted segments. They are cut asymmetrically and are closed with two buckle straps in the back. Sold in pairs. These elaborately decorated bracers are a real eye catcher. The surface of the upper part has got a kind of hammer finish. The lower part is embossed with a decorative pattern. 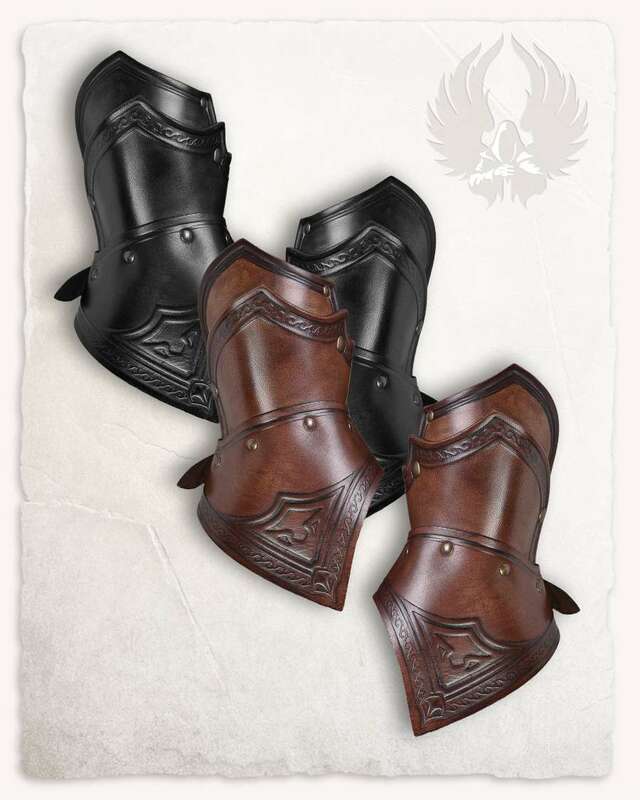 They go very well with the Antonius cuirass and of course the Anvard greaves. A simple but effective underarm protection for archers. It is made of soft artificial leather and can be fastened with hooks. Fore-arm protection for archers. The straps are worn at the outside. The inside is cut out widely not to hinder the arm from bending. 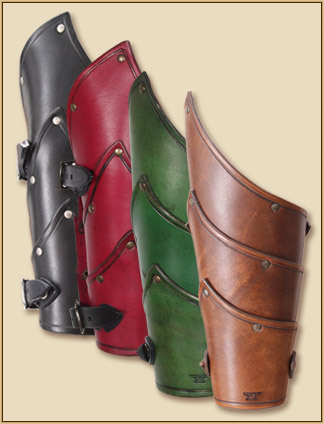 They are available in two different sizes.The price applies for one single bracer. 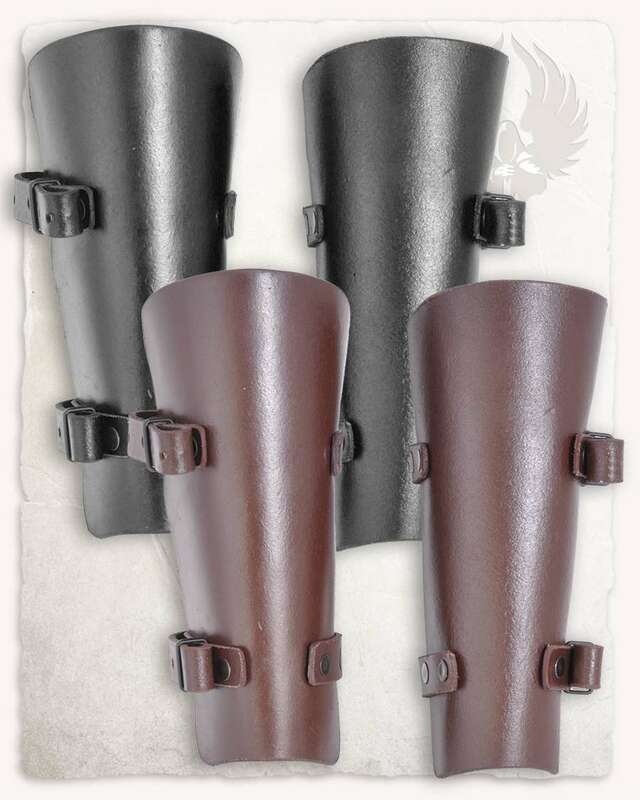 The "Felix" bracers for small heroes and heroines are made from extremely sturdy leather, very flexible and offer protection against bruises. A simple but effective underarm protection for archers. It is made of soft artificial leather and can be fastened with hooks. The attached loops are worn over thumb and forefinger to protect them when drawing the bowstring. 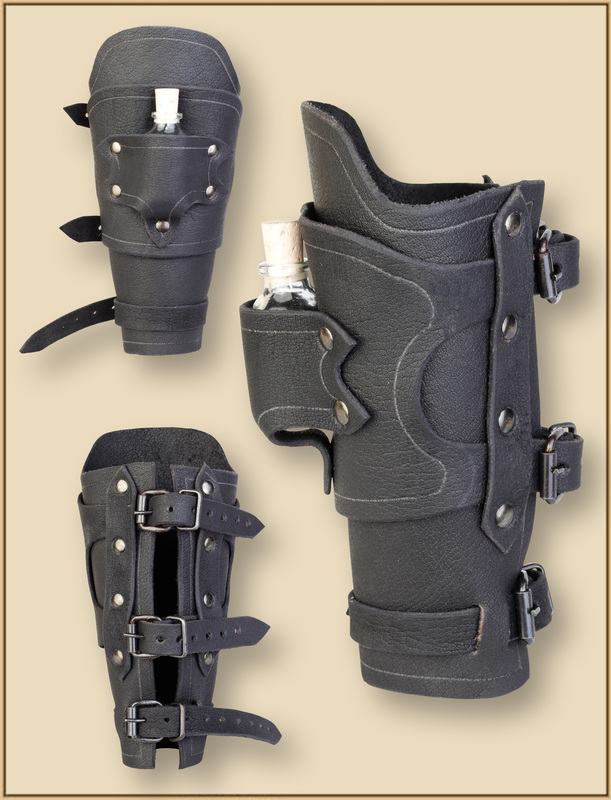 Made from heavy leather uppers, you have a bracer and the carrier for a potion bottle linked together. 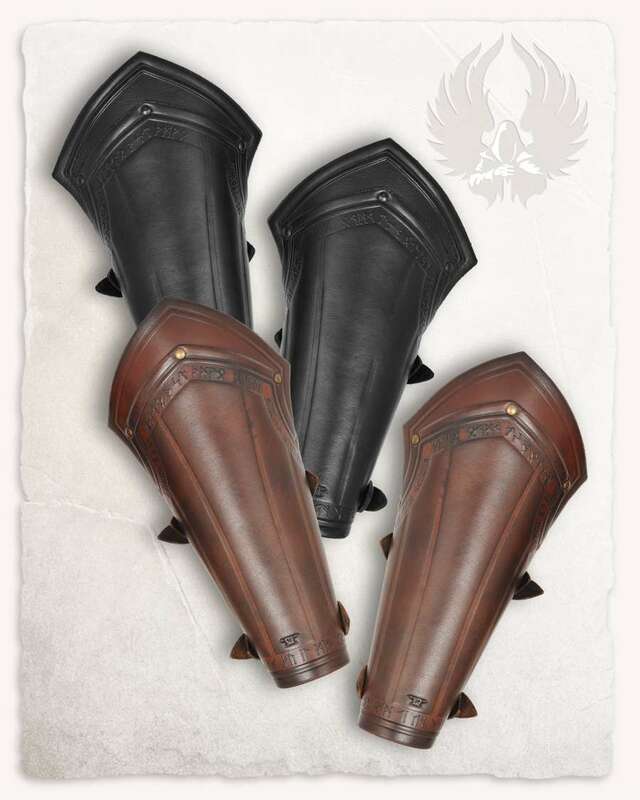 Price is for one vambrace. Potion bottle not included. A pair of bracers from the "Kendra" range. These bracers are a real treat for your forearm. Use them not only for protection, but also to detail up your entire costume. Great as an add-on for small forearms as well. These elegant bracers are composed of two riveted segments. The egdes are embossed with embellishments. They are closed with two pretty buckles in the back. 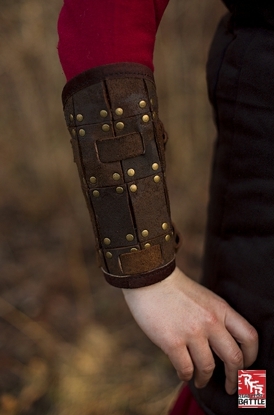 These pretty bracers are composed of two riveted segments. They are closed with two buckles in the back. 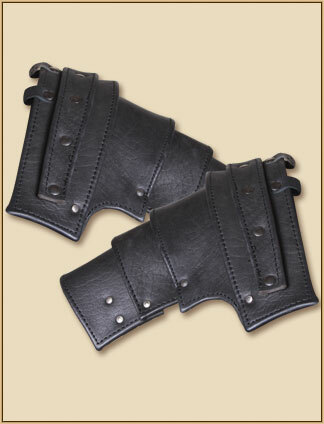 This pair of leather bracers are a premium product. These have detailed celtic knots applied to the surface. The bracers are closed with two buckles. These are the second edition version. 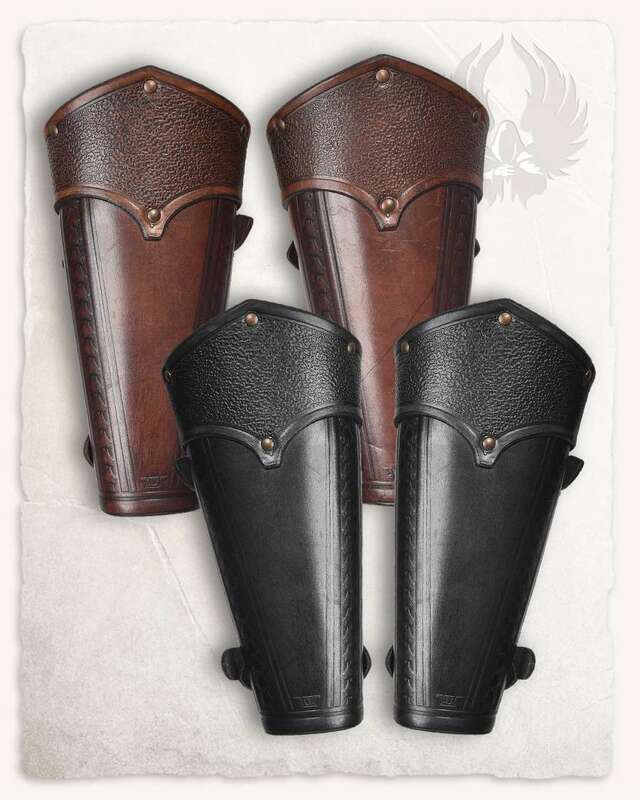 The Octavius leather bracers are closed with laces on the back. The are simple but very becoming and suitable for various costume ideas.Sold in pairs. 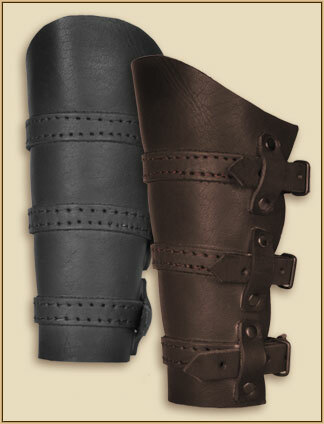 These are the matching leather bracers for the "Rasmus" series. They are closed with three buckles and are very comfortable to wear. They adapt to almost everyones arms. 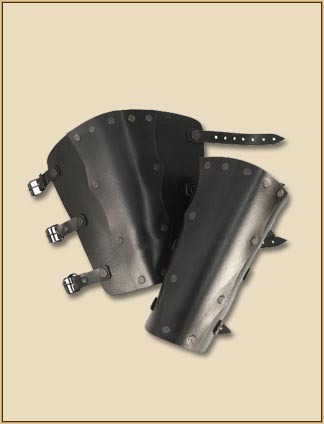 These bestselling Ready For Battle Bracers are a set of armour pieces designed to protect the forearm against weapons and bowstrings. 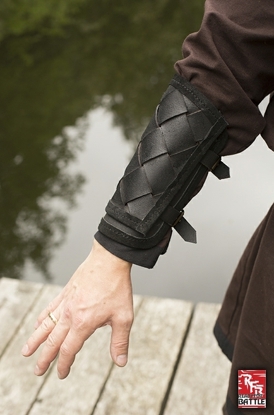 These bracers are made from braided leather straps, which are riveted together. They are very comfortable to wear and adjust to your arm very well. Close them by using the two buckles. 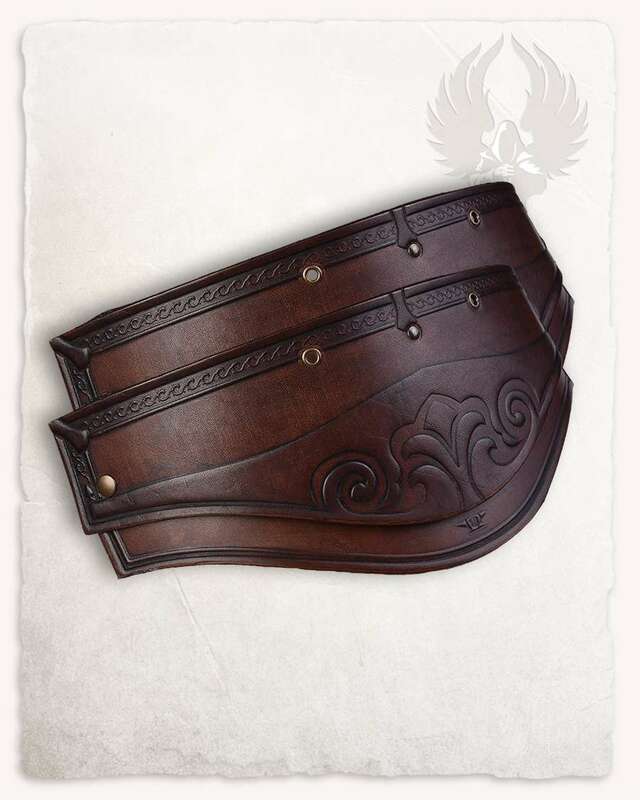 Some pretty leather bracers with a decorative lacing in the front. 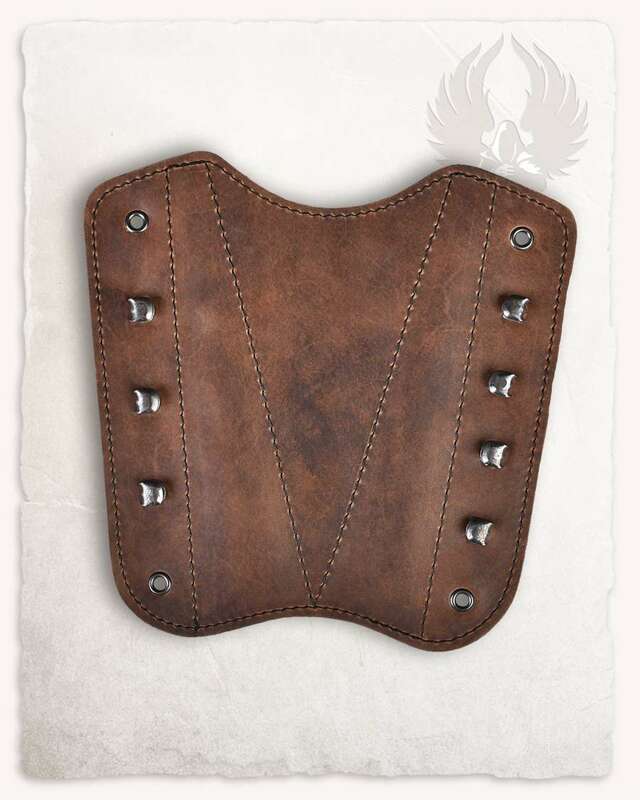 They are assembled of five parts and are closed with a leather band and eyelets in the back. 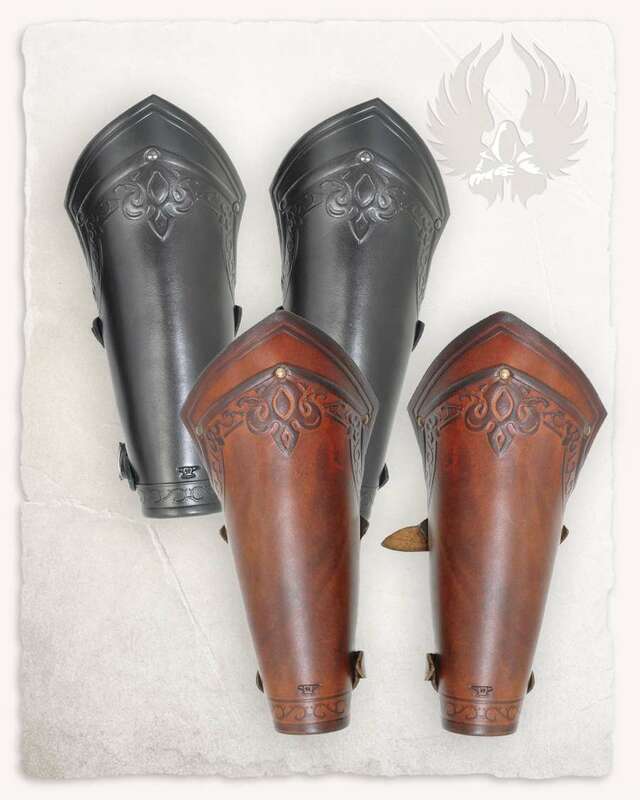 Here you will find the matching greaves. Sold in pairs. 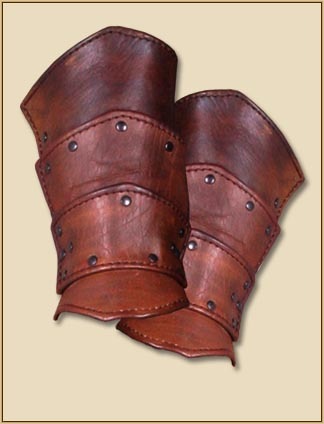 A simple pair of leather bracers. The three straps they are closed with are sewn on all around the surface. They are suitable for various costume ideas. WHILE STOCKS LAST.These bracers have an integrated hand protection at the front. This can be attached to the hand with a loop at the back. This does not only look good, but also protects you from painful blows to the fingers. 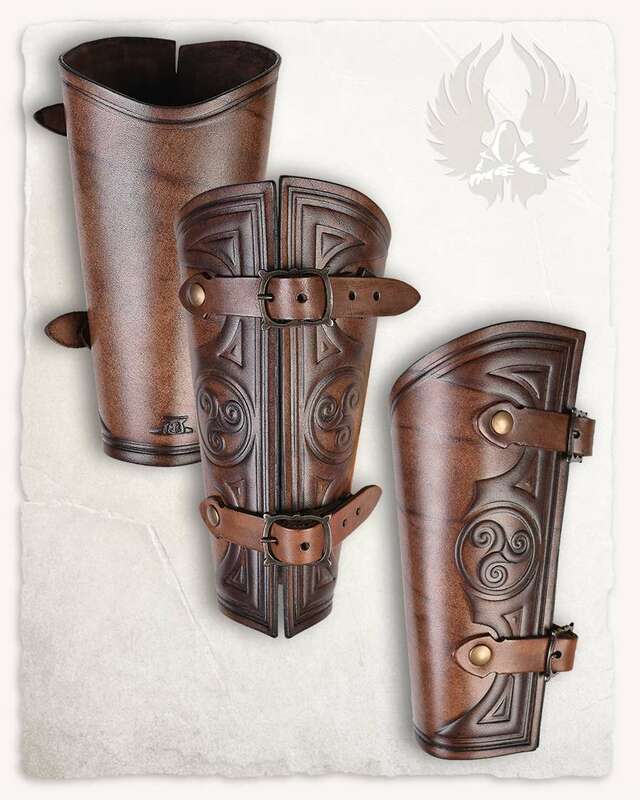 The "Torson" bracers' design is detailed with nordic "Futark" runes and lines along the ridges and edges. 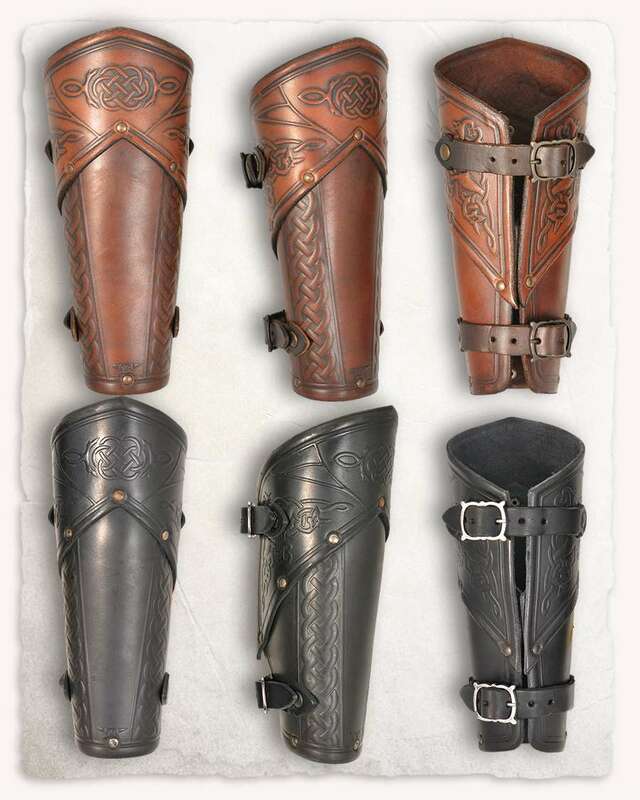 This leads to a "typical" nordic look of those greaves, as known from detailled descriptions of these nordic people. The armour is constructed from leather straps cut from chrome-tanned, split leather, and weaved together to create a beautiful design. 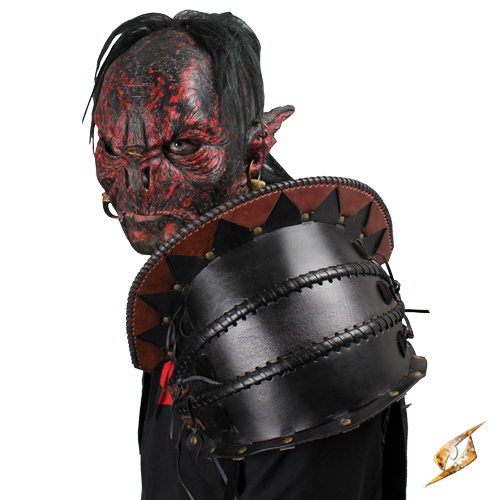 The armour is secured to the arm by sturdy leather straps and brass buckles. 2nd Edition Decius Leather Mitts. These simple leather mittens have got loops for thumb and hand on the inside. The width can be adjusted with a buckle strap around the wrist. 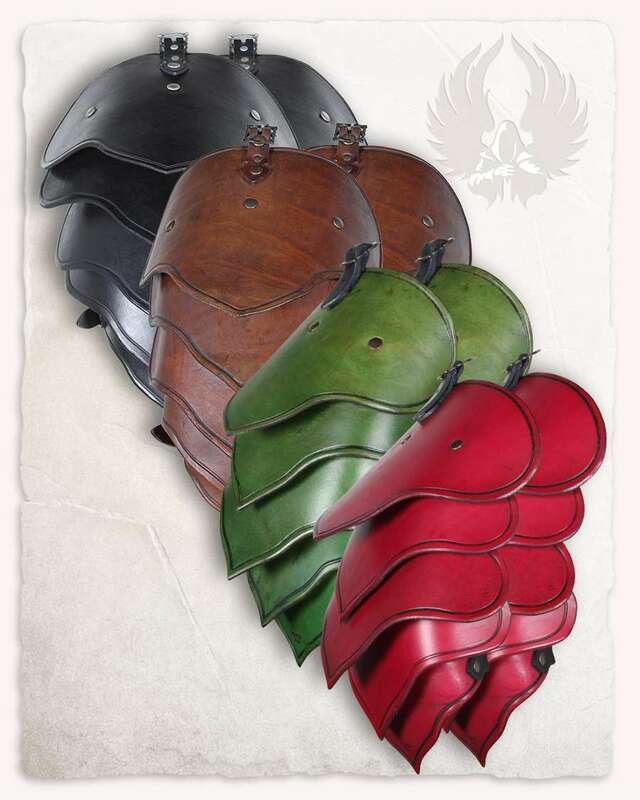 A very becoming piece of armour that suits various kinds of armour.Sold in pairs. 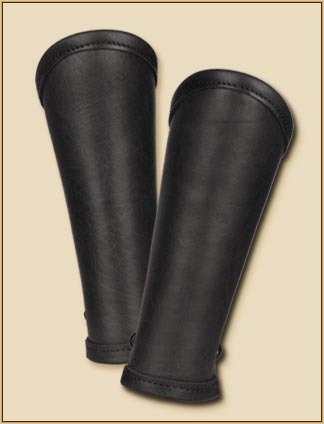 The robust mittens "Sulla" are elaboratly crafted and made from high quality upper leather. The inner side is equipped with straps for thump and palm, so they have a tight fit on the wearers hand. Sold in pairs. A sturdy leather gauntlet to keep those precious fingers intact. Left and right hands sold separately. 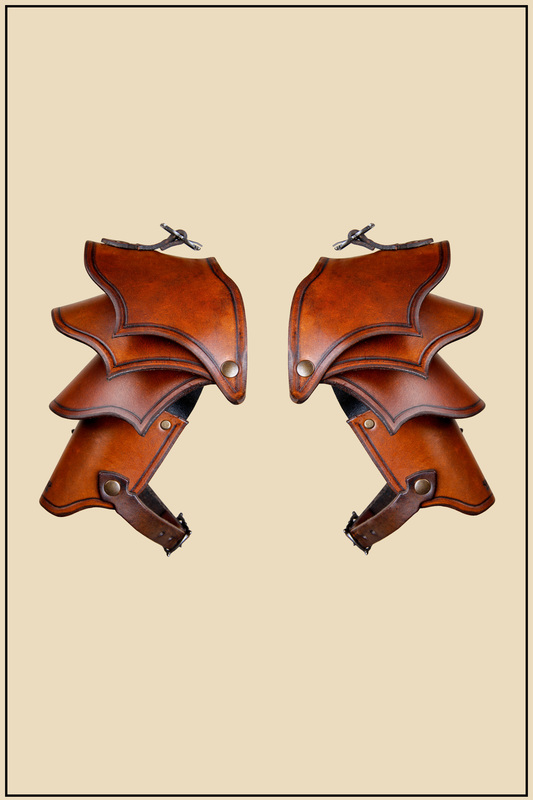 The matching spaulders for the "Antonius" leather armour. The seperate segments are movable and dont limit the movement. The elaborate punchings and the antique finish are a real eye-catcher. 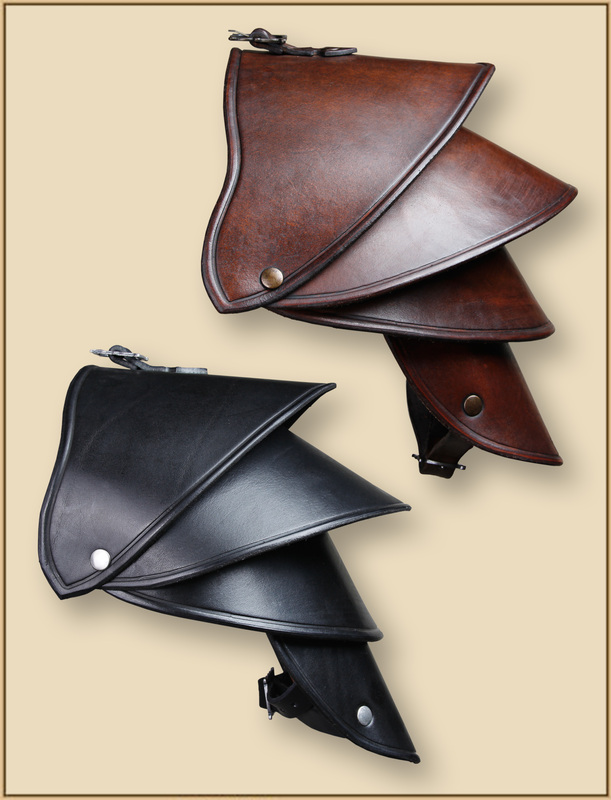 These imposing looking leather spaulders are composed of five flexibly linked segments. 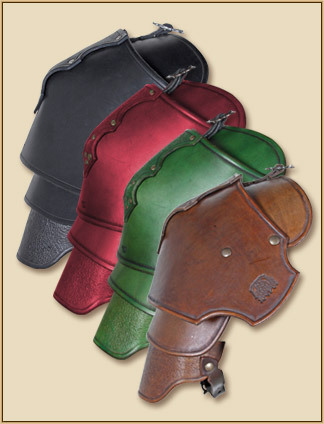 A set of leather armour that covers the shoulders, upper arms and base of neck. These Leather shoulders are a very good add-on to the torso armour. These shoulders are closed with several buckles on your shoulder and upper arm. 3mm Chrome-tanned leather and felt padding. Can only be used on left shoulder. 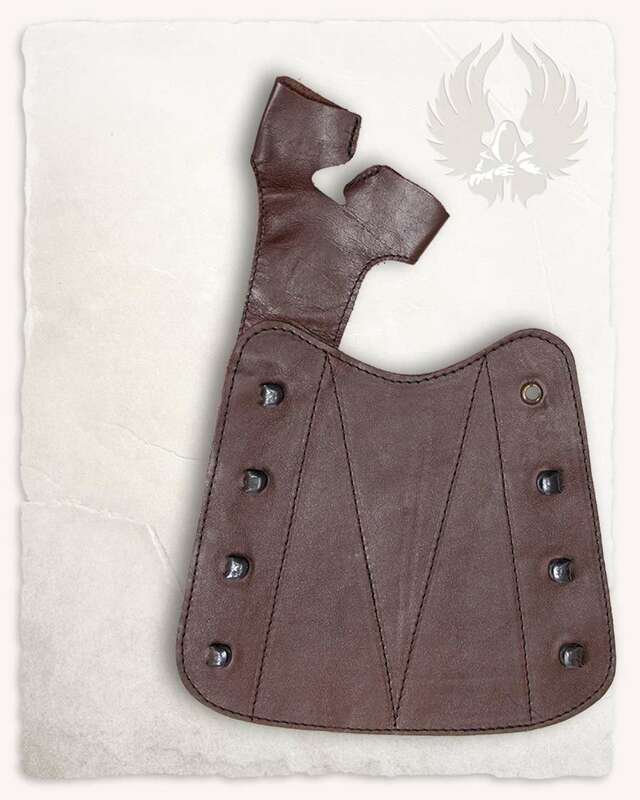 This is the matching shoulder armour for the Crisso asymetrical shoulder harness. Combine both articles to get the set.The shoulder itself is made from four seperate, riveted, pieces and is therefore very flexible when worn. 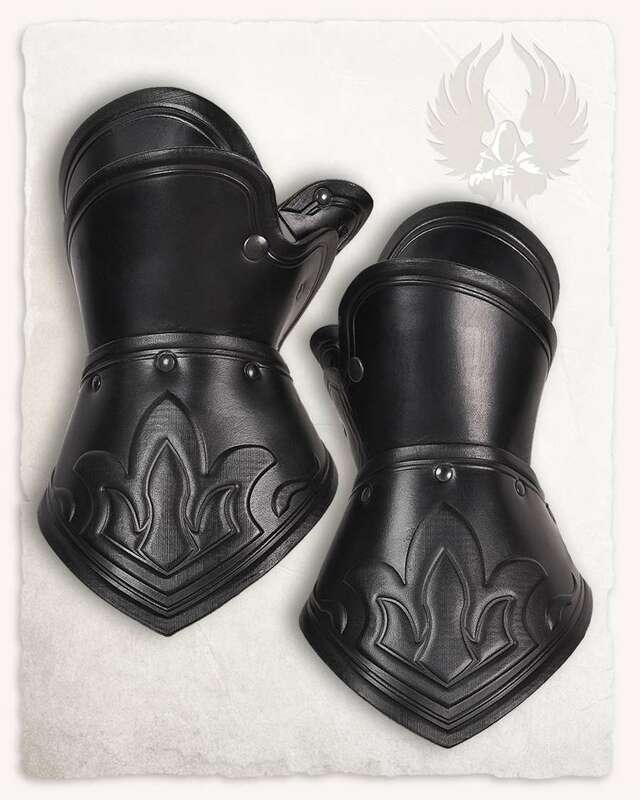 The matching pauldrons for our leather armor Gregor. They are made up of three single parts decorated with a riveted brim. These are four-piece spaulders.The thick leather uppers is decorated with a nice detail along the edge and rounded.Fits great when worn in the complete Kendra set. 3mm Vegetable-tanned leather. Can only be used on left shoulder. The Roman Shoulder Armour comes as a pair. 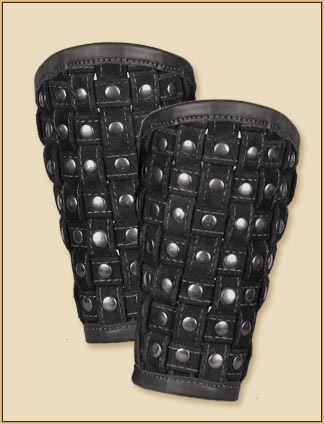 Roman style leather pauldrons. 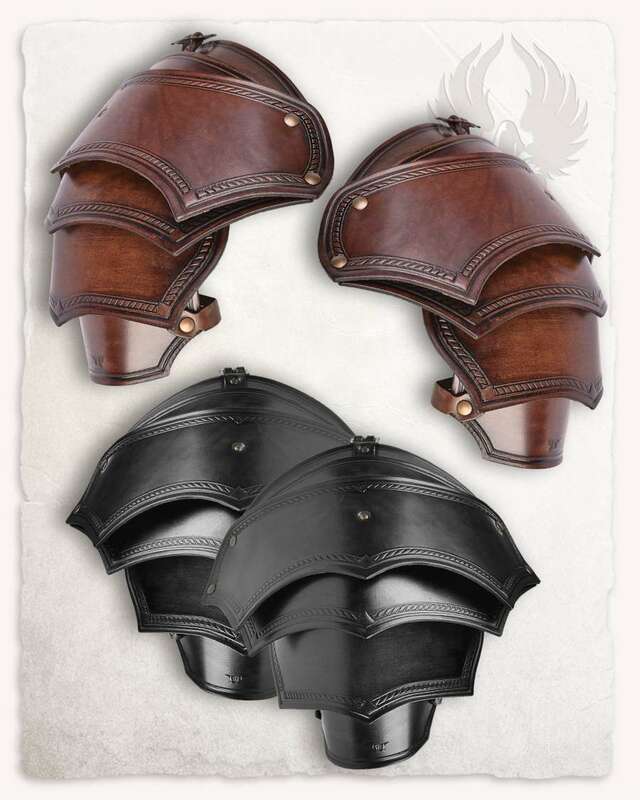 They are made of four flexibly connected segments and can be attached to various types of torso armour from the fucina del drago series with a buckle on the top part. Sold in pairs. The armour is constructed from leather oblongs cut from chrome-tanned, plated leather, riveted with brass studs onto soft split-leather. 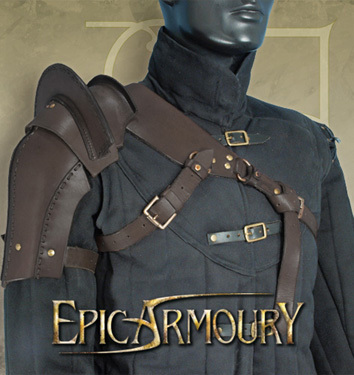 The armour is secured to the arm by sturdy leather straps and iron buckles. 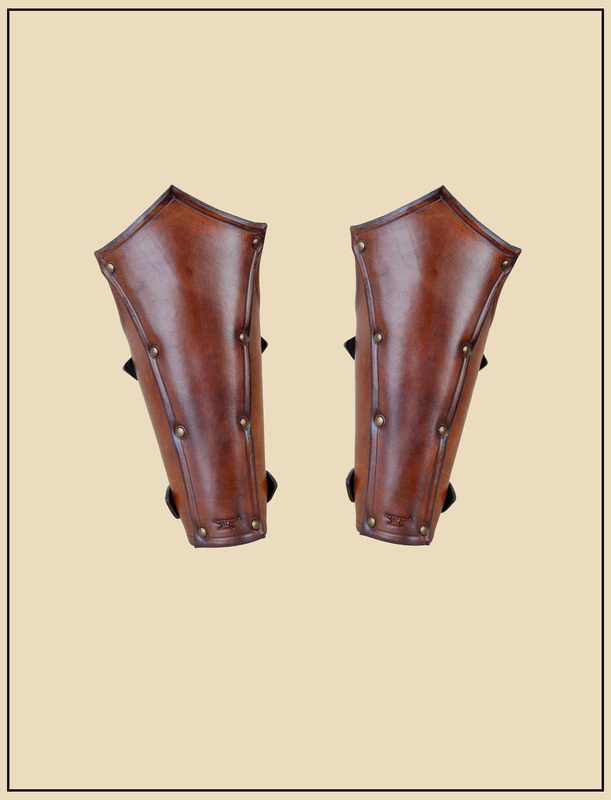 Leather vambraces for an honourable Samurai or lordless Ronin.